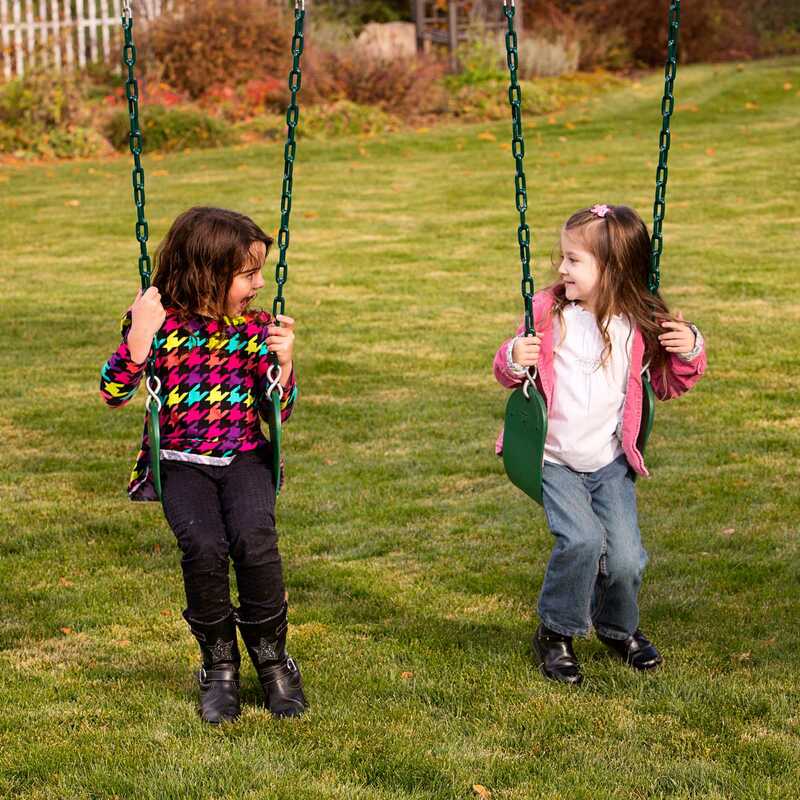 The Big Stuff 411000 Green Belt Swing is recommended for ages 3-12. Seat - 26" x 5 1/2"
If you are wanting this belt swing for an existing Lifetime A-Frame swing set, please note that the chains are too short on this belt swing to match the height of the A-Frame swing set's height. You will need to find your own chains to get the belt swing down to the proper height. Competitive Edge Products, Inc. is an authorized retailer of Big Stuff Play Sets and Swings and other Big Stuff playground equipment. 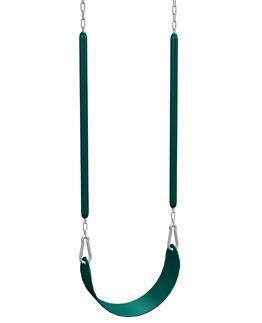 Can this belt swing be used with other playground equipment? In short, yes. The chains have a universal clip that can attach to most receivers found on other manufacturer's play sets. The major points of concern that need to be considered are if the play set you are attaching this belt to is strong enough for the intended user on the swing and if the play set height makes the swing too far off or too close to the ground. If any of these points are a concern, do not use the swing. If not, you should have no problem attaching the clamp to the receiver. Exactly as posted! Super Seller! The swing was very high quality, better than I expected. Thanks! 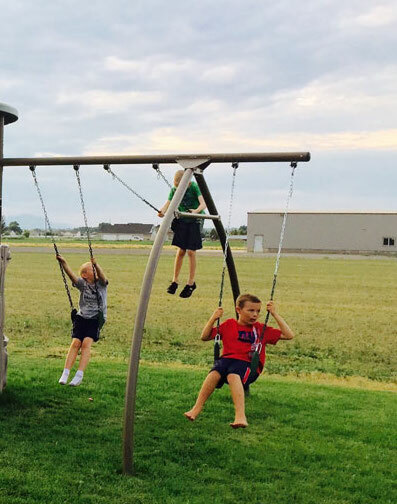 I bought this swing a month ago to go with my freestanding lifetime swing set. I am very happy with the quality and durability of all my lifetime products. I wish I would have read the description more accurately, since the swing was too short for the freestanding 10 ft swing set that I purchased. We added a few links of chain to the top and now it is fine. I will continue to buy lifetime products for all my outdoor play needs. The item was exactly what we needed and we were more than pleased with the product. we were also very pleased with the delivery time. Purchased the Lifetime 290038 A-Frame Three-Station Swing Set and wanted a third swing instead of trapeze bar. This swing matches the others perfectly. Just be sure to call in the order so you get the swing with the longer chain for this particular swing set. These swing are the best swings I have seen. Strong and durable. I would definitely buy them again. Q: Is there any thing that can be done about the swing rubber grips? They have become sticky and gross and they leave residue on my grand children's hands. A: For that you will want to call 1-800-225-3865. Q: Can I use this on the A-frame swing set or which playgrounds does it work with? A: This does not work with A-frame swing sets, because the chain is too short for those models. This does work with the other lifetime playgrounds that have slides, climbing walls, monkey bars, etc. Please contact us if you have any questions about compatibility. Q: How does this attach to the top of the chain? 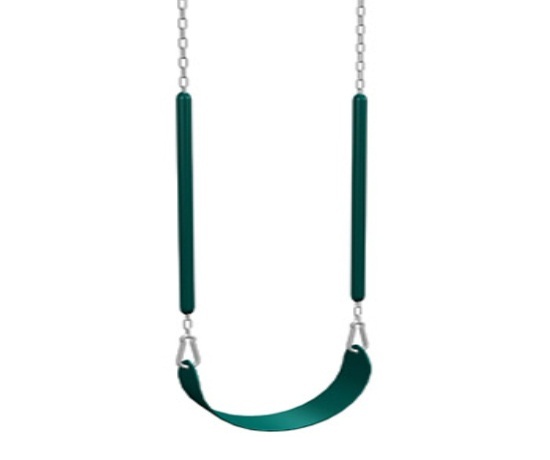 A: It uses heavy-duty galvanized carabiner clips that make it very quick to clip and unclip if you are trying to change this out with the trapeze bar or a toddler swing. Dimensions: 13" x 13" x 12"